In 1970, world renowned diamantaire Laurence Graff OBE created Hair & Jewel – an ornate coiffure comprising one million dollars of diamonds and precious gems. 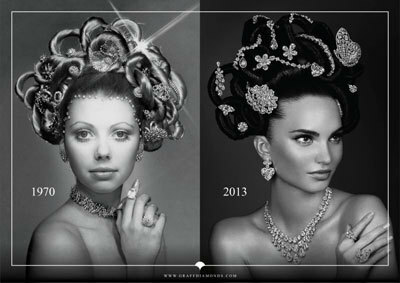 To mark the success of Graff Diamonds globally and to celebrate Laurence Graff’s 60th anniversary, they have recreated the famous Hair & Jewel in celebration –featuring 22 extremely rare and unique jewels with a value of half a billion dollars. Incorporated into the recreation are a number of record breaking diamonds that have been cut and polished by Graff, namely the Graff Sweethearts; a magnificent pair of earrings featuring 51.53ct and 50.76ct D colour Flawless type IIA heart shape diamonds; and a selection of jewellery crafted from the 550ct Letšeng Star, the 14th largest white rough diamond ever discovered. It is more than 40 years since the original image of Hair & Jewel was captured. The recreation marks an important milestone in Graff Diamonds’ history and coincides with the opening of its 40th store globally. For further information, visit graffdiamonds.com.